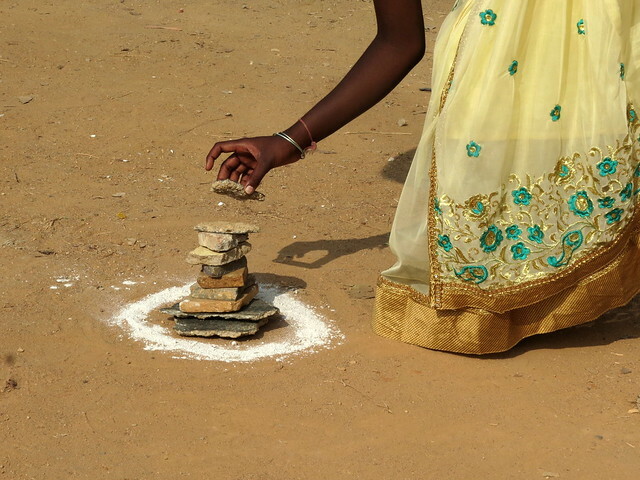 We often lament about our children using tablets and X-boxes all the time…but I find, often that even our urban children are quite in touch with the traditional games of childhood. Today, when I went to Kaikondrahalli lake for the kere habba, I found this pile of flat stones, with a young girl piling them up carefully. was in progress, and waited a bit while the girls surrounded the pile of stones and began their game. The game involves a ball and a pile of flat stones, generally played between two teams in a large outdoor area. A member of one team (the seekers) throws a tennis ball at a pile of stones to knock them over. The seekers then try to restore the pile of stones while the opposing team (the hitters) throws the ball at them. If the ball touches a seeker, she is out and her team continues without her. A seeker can always safeguard herself by touching an opposite team member before the ball hits her. There are some other rules that may be added in different regions of the country. 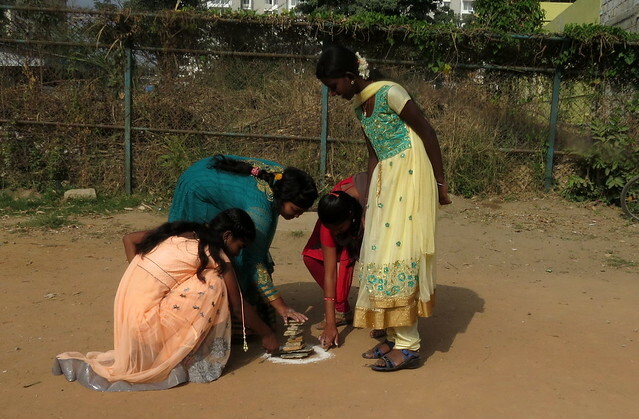 So here, to please all of us, is the scene of children (the girls were dressed for the kere habba or lake festival; thei school is adjacent to the kere) playing a traditional game which does not need electricity, and which is one that their parents and grandparents have probably played!